With one-part luck and one-part planning, a small-town Ohio couple brings a welcoming and peaceful perspective to their retirement retreat. 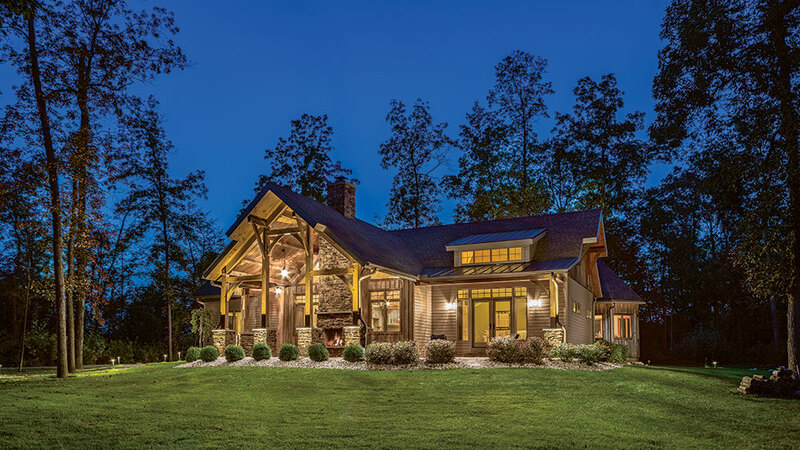 If you’re one of the lucky ones invited to the couple’s 4,800-square-foot timber retreat, the purpose of your visit is clear from the moment you arrive: relaxation. The result of a daring design decision, timbers span over a spacious patio situated in the front of the home, rather than the rear. 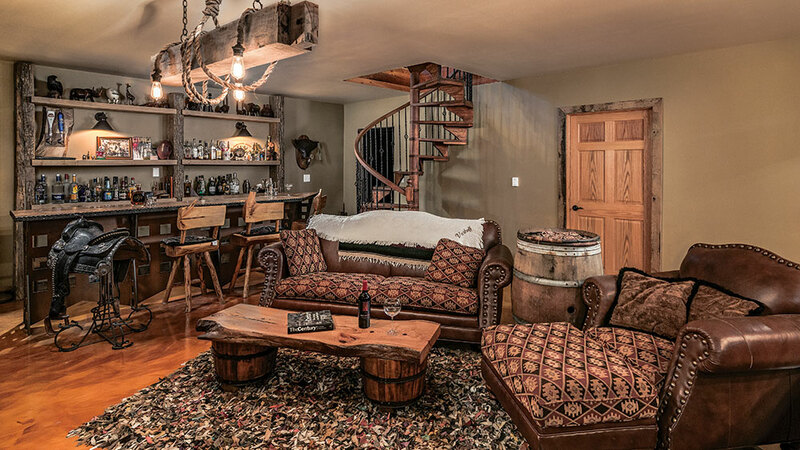 An intentional arrangement of chairs gathered around a stone fireplace practically begs you to linger. Here, lounging and long conversations aren’t just encouraged — they’re required. And, that’s exactly what the couple was craving when they decided to build the custom home. After raising their family in the suburbs, the couple longed for a slower pace and a home surrounded by water, sun, sky and wildlife. They began searching for a property and struck gold when they discovered a site with the infrastructure already complete. They came in second on the bid, but luck struck again when that deal fell through. They snapped up the property and agreed that nothing but a timber frame would do. “We’re surrounded by trees, so building a home that feels like it’s part of the woods was really important to us,” explains Bill. Following fate’s lead, the couple teamed up with Oakbridge and, with a vision in place, a home made for gathering and recharging emerged. The heart of the house is an open concept living area that encourages both conversation and movement. The design also includes a basement recreation room, children’s play loft, a master en suite and three guest bedrooms. In each space, there is “a design and a flow that makes you anxious to see what’s ahead,” says Johnny Miller, co-founder of Oakbridge. There is also an urge to linger, probably to dwell on the details. 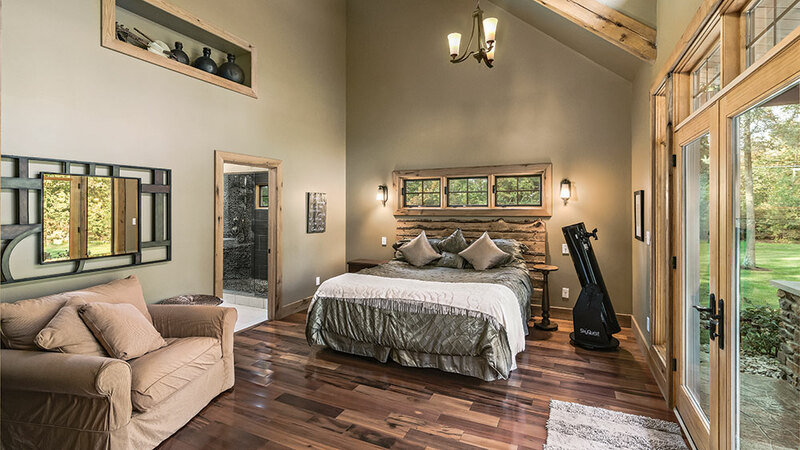 Throughout three floors, classic timber lodge elements abound, “With a little Craftsman and Prairie style mixed in,” says Johnny. 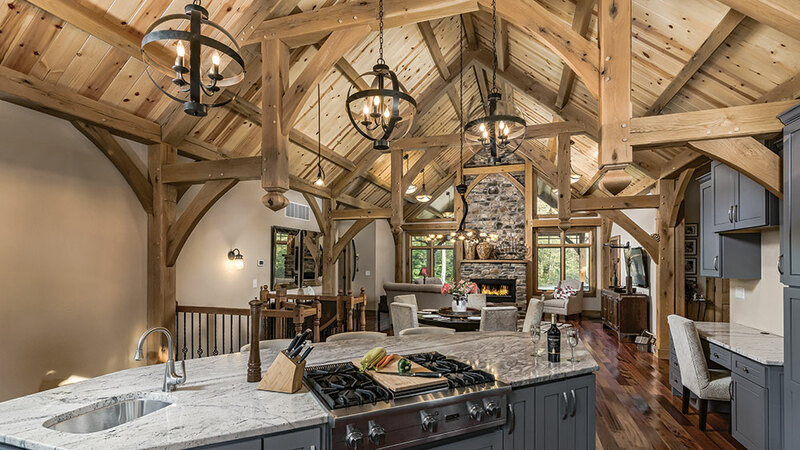 Besides the home’s white oak frame, wood details include eastern white pine tongue-and-groove, hammerbeam trusses with acorn embellishments (handmade by Johnny’s father) and extra-wide trim on the windows and doors. 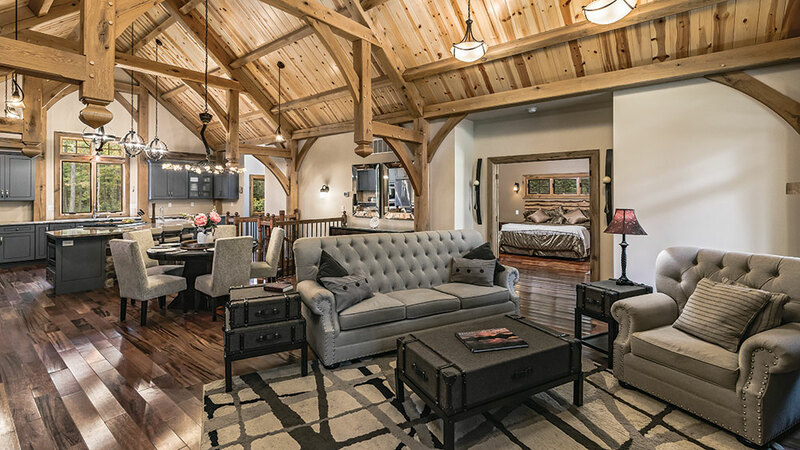 The couple juxtaposed the rustic timber interiors with contemporary finishes and furnishings. 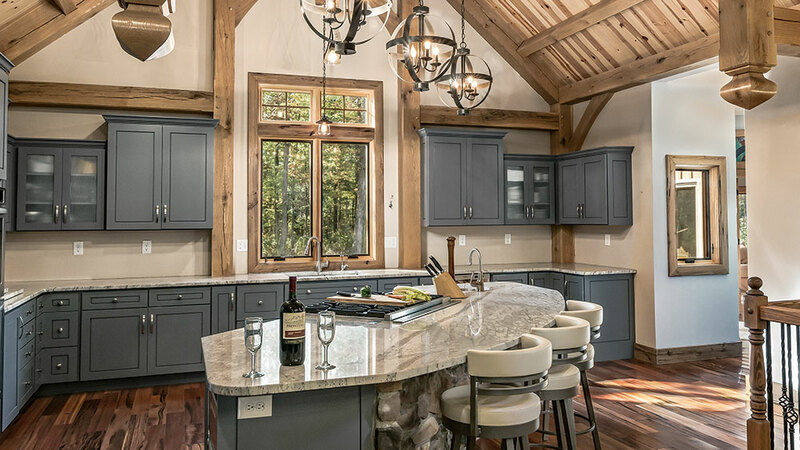 Dark wood floors flow from the kitchen, with its gray cabinets and granite countertops, to the living area where neutral furnishings and rich layers of texture add interest. 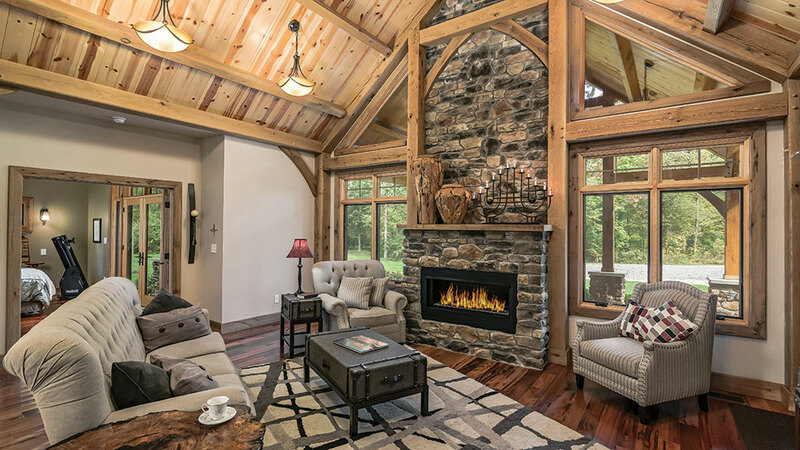 A grouping of comfortable chairs and a sofa creates an intimate conversation area around the gas fireplace, chosen over a wood-burning one for easy year-round ambiance. The kitchen is a cook’s dream, with a functional layout, stainless steel appliances, a spacious island with a prep sink, cooktop and trio of barstools (for company while you cook); not to mention the deep gray custom cabinetry of various sizes and depths. 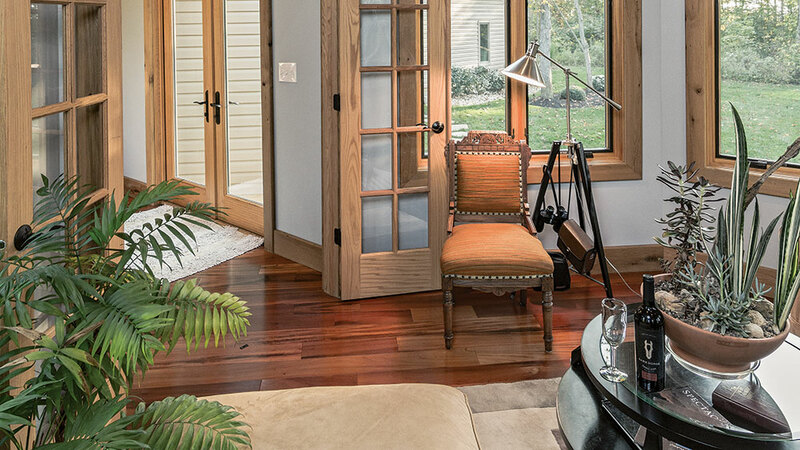 In a design that’s as wide open as a timber home is, defining spaces can be a challenge. Here, the Verhoffs successfully create separate living and dining areas with strategic furniture placement, eliminating the need for walls. An abundance of natural light energizes the master bedroom and beautifully highlights the room’s architectural details, like a framed niche filled with pottery. A wall of French doors with transom windows overlooks the front patio, while a shed dormer opens up the room, creating an airy feel. 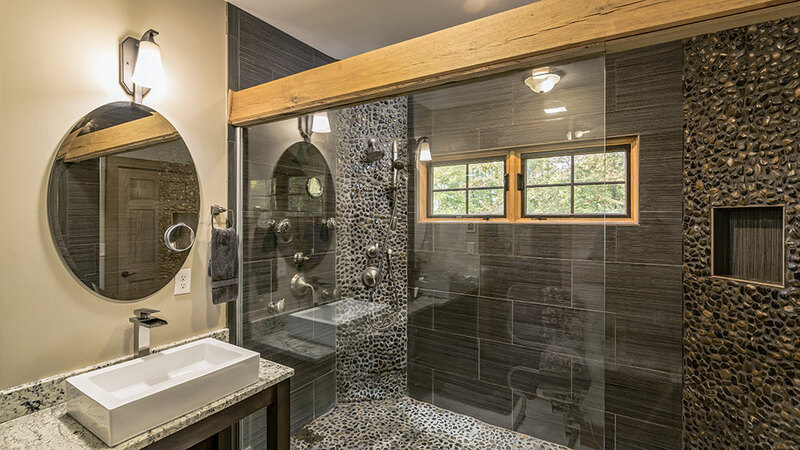 A chic, calming aesthetic defines the master bath, which includes a pebble tiled-shower with spa-inspired water features, a raised-basin sink with flat edge and a timber header over the glass doors. 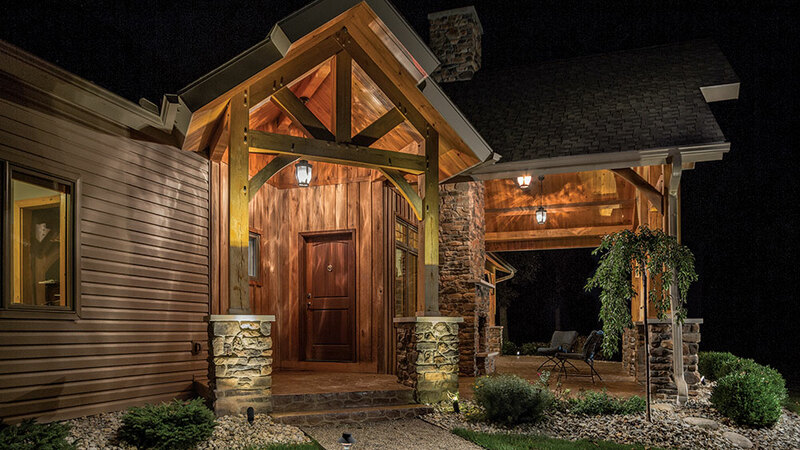 From first glance, the exterior of the home gives off an everyday-is-a-getaway vibe, thanks to the welcoming front patio and casual, understated entry that signal you can dispense with the formalities. 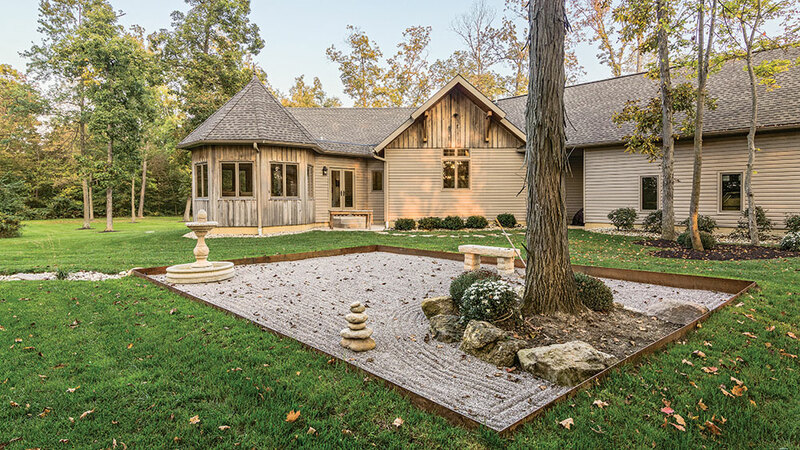 The home’s neutral exterior, with its naturally-aging poplar siding cut by local sawmill Kries Lumber, is a perfect complement to the intentionally simple landscaping and Zen garden. A spiral staircase gives the downstairs recreation room an exclusive feel, while timber shelving, a solid steel bar with hardwood top and African-themed masks give the room added flair. The African influence is a tribute to Monica’s father, who was the director of the Toledo Zoo.